IBM UBX (Universal Behavior Exchange), one of AppsFlyer's integrated partners, is a feature of the IBM Marketing Cloud and other IBM Commerce offerings, allows marketers to take control of all their customer data integration with an easy-to-use console. This open data exchange capability provides a contextual view of customer buying behaviors across all channels, devices and interactions, so marketers can quickly design and deploy effective campaigns, delivering meaningful experiences in an instant, while driving ROI. Enter "IBM" in the search field and click on its logo to open the IBM configuration window. The IBM configuration window only makes use of the Integration tab. 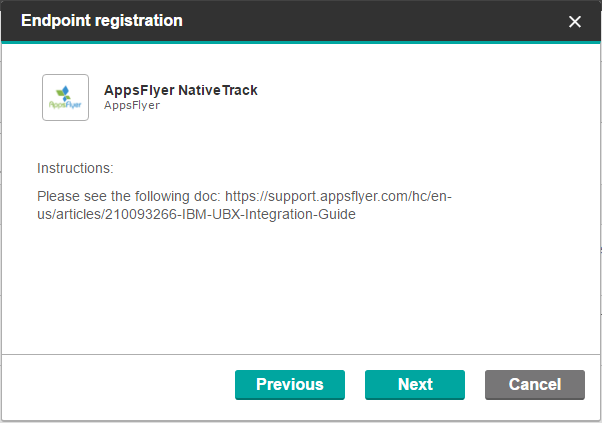 IBM connects with AppsFlyer via a unique Authorization Key. If you don't already have it, you must obtain it from IBM to continue with the integration or follow the steps below. 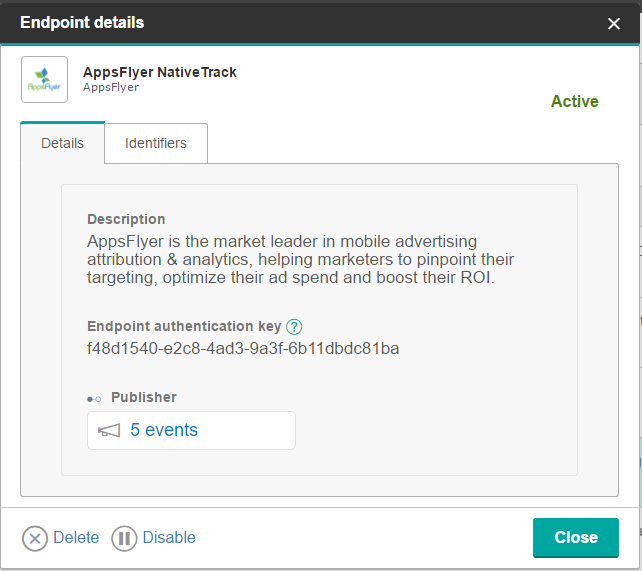 The first step in setting up a generic AppsFlyer event publisher endpoint is to create a blank endpoint in the UBX interface. Next, select AppsFlyer and click Next. Click on the 3 dots on the right side in the newly generated AppsFlyer endpoint and click endpoint details. AppsFlyer can send automatic postbacks to IBM user installs. Use this section to define sending these postbacks. 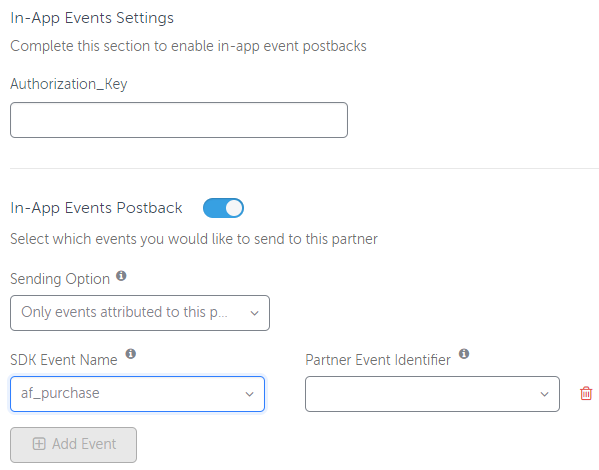 Select Events attributed to any partner or organic to send postbacks for any user that downloads the app to IBM or select Off. 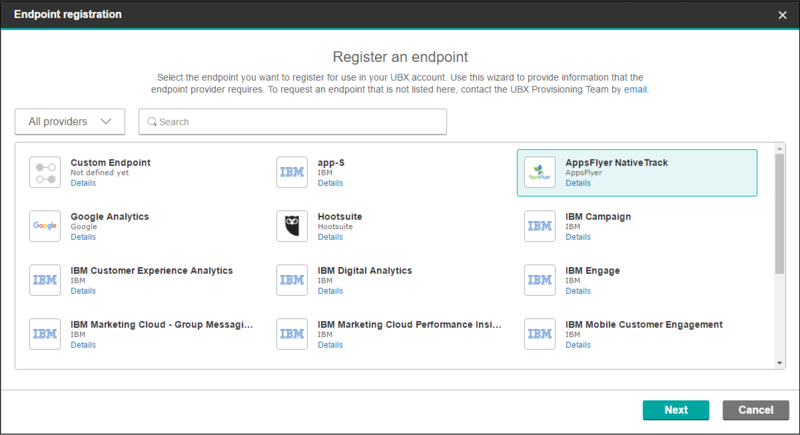 In this section you can map your AppsFlyer events with IBM via postbacks. Enter the Authorization Key again. Partner Event Identifier The unique name or ID of each event as defined on IBM's side. Obtain the corresponding Event ID from IBM and set in the text field. Tracking Links are not available for IBM. Permissions are not available for IBM.